We often find it harder to celebrate policy successes than decry policy failures. So you might have missed a policy success which we are marking this week. We are about to have completed the successful initial rolling-out of automatic enrolment into occupational pension saving. Millions of employees will enjoy higher living standards in retirement as a result. Following the recommendations of the 2004-06 Pensions Commission, auto-enrolment was set in train by Labour in the Pensions Act 2008 and shepherded into being by Conservative-led governments since. It entails all employees above an earnings threshold having a portion of their pay automatically diverted into a pension scheme, with a right of opt out and compulsion on firms to make contributions too. In just six years this policy has brought ten million people into pension saving, with about £20 billion more being saved for retirement annually as a result. Initially this was at very low contribution levels. But these were stepped up last year, and will go up again on Saturday, so that employees now contribute a minimum of 5 per cent of eligible earnings, plus 3 per cent from employers. A big part of auto-enrolment’s success story – and a feather in the cap of nudge economics enthusiasts – has been the very low rates of opt out, which have hovered just above 5 per cent and were actually lowest (at 4.7 per cent) just after contribution rates went up last year. The reality has been a far cry from the government’s original 30 per cent opt-out assumption. This is all the more impressive given the wider economic climate of weak wage and income growth. For a typical employee, the 5 per cent minimum auto-enrolment contributions entail a reduction in take home pay of £945 annually relative to no pension saving, potentially wiping out the bulk of real wage improvements in recent years for someone previously saving nothing. This is a reminder that most good things in life entail trade-offs: the admirable goal of saving more for the future puts even more pressure on pay packets today. There is a consensus however, that current levels of pension saving won’t be sufficient to deliver retirement incomes commonly deemed adequate. So the end of auto-enrolment’s positive initial journey shouldn’t be a time for resting on laurels, but rather a chance to consider how to keep moving forward. It’s welcome that the government has already stated its intention to go further in the ‘mid-2020s’, including by reducing the lower age limit from 22 to 18, and scrapping the lower earnings limit so that contributions are made on every pound that is earned by eligible employees. But there are plenty of ways to make auto-enrolment even more ambitious. Our Intergenerational Commission recommended expanding the group of people accruing pension contributions. Firms contracting self-employed labour should be required to make contributions to individual’s pensions, while employee eligibility should be extended to all those working the equivalent of at least 15 hours per week on the National Living Wage (around £6,500 a year, down from the current £10,000 eligibility threshold). 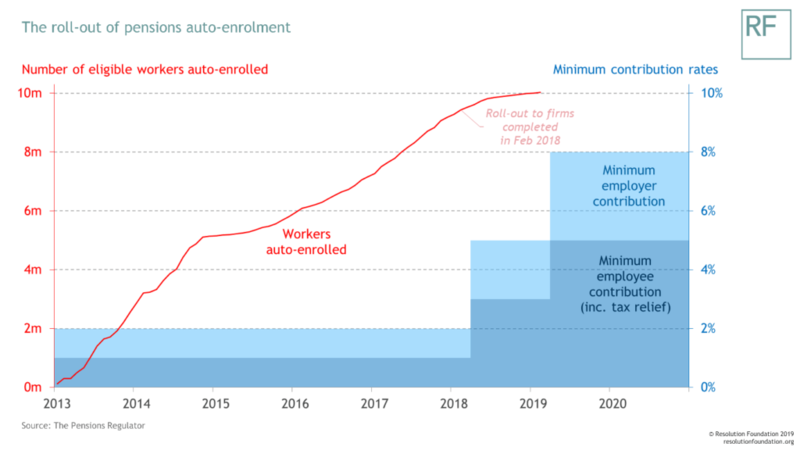 The very low opt-out rates so far also suggest that contributions should continue to be ramped up so that employers and employees are putting in the same share. Of course it’s not just employers and employees that can make a difference on pension saving – the exchequer also plays a role via tax reliefs. On this, lower and middle earners would be better supported by a flat rate of income tax relief, as opposed to the current system in which 46 per cent of its near £30 billion cost goes to the top 10 per cent of taxpayers. This would boost savings for four-in-five eligible employees. Driving up contributions is only one side of today’s pension challenge, however. Our detailed modelling of pension outcomes across and within generations showed that the key difference between the old world of ‘defined benefit’ (DB) pension schemes, and the future world of predominantly ‘defined contribution’ (DC) pots that today’s young adults are building up, is the higher level of risk born by individuals. Weak or variable investment returns. For example, a plausible 1 percentage point reduction on the government’s central scenario for annual real rates of return in future would lower millennials’ retirement incomes by 8 per cent. Beyond long-term investment performance, there is also the problem of variation in returns, given some people will inevitably have the bad luck of receiving lower returns than others as they are asked to make big decisions on investments at certain points in life. Variation in life expectancies, particularly over the course of retirement for those who choose not to annuitise. Consider, for example that there is around a two-in-five chance that two men aged 65 today live to ages at least 10 years different to one another. Managing this variability risks individuals either leaving too much set aside as a precaution, or too little if they live longer than they expect to. Inflation rates over retirement, given that many people don’t take an annuity, and the vast majority (94 per cent) of those who do purchase flat-rate cash (‘level’) products. So, as well as driving up contributions, we also need focus on risk reduction. We call for larger schemes that are better able to share risk among savers, and for the same reason support the government’s promotion of ‘collective defined contribution’ (CDC) schemes. The recent Department for Work and Pensions consultation and the development of Royal Mail’s CDC scheme are encouraging steps forward. Default pathways leaving those with DC pensions a pot for a guaranteed income in later retirement would further mitigate against risks. The first phase of the journey for the new 21st Century pensions architecture ends this week. We now need to keep the wind in its sails by expanding and rebalancing contributions from employers, employees and the government. More ambition on contributions, plus a new focus on reducing the headwind of risk that is looming down the track, is how we help to deliver the level of living standards in retirement that workers today aspire to.